A wardrobe staple for the colder months. 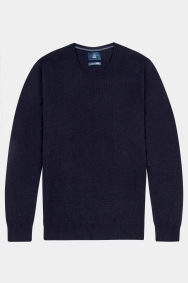 Every man needs a versatile navy jumper to hand. Whether you want to layer up for the office or pull off a smart shirt and jumper combo on your next night out, this crew-neck piece from Moss 1851 fits the bill. Italian-made and crafted from pure merino wool, it’s not only soft and warm, but incredibly breathable too. The jumper’s navy tone will go with almost any of your staple items. Keep it casual by pairing it with dark jeans, or opt for some tailored trousers for an on-trend look that will demand attention.